SMS is part of our lives and has already become a medium, perhaps one of the most popular social mediums used by people. Advertising via SMS is a business. While many companies pay mobile phone subscribers to agree SMS advertisement will be landing in their mobile set, there are others, like James Robinson of Australian start-up HooHaa, who are confident users will sign up for no payment. 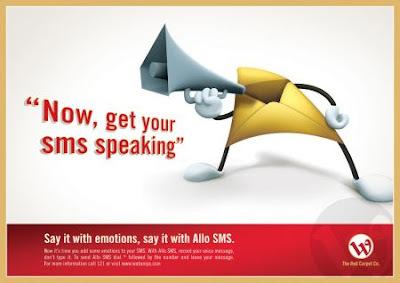 SMS related Innovations follow each other every day: Wataniya Telecom, for example, a wireless voice and data networks operator, offer a new service named Allo since a few months ago allowing sending SMS with recorded voice message (see above sample from their ad campaign). 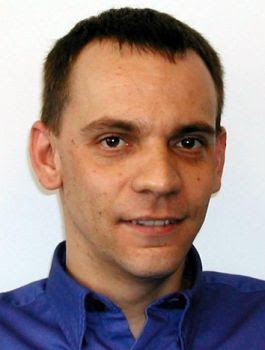 Yet, it was just 15 years ago this very week, when Airwide Solutions engineer Neil Papworth pressed the first "send" command and sent the world's first SMS to a few of his friends at Vodafone. Even though it was carrying just the two simple 'Merry Christmas' words this massage opened the door to the multi-billion dollar industry of Short Message Service (SMS) allowing people sending short messages to and from mobile phones. No one seems to know exactly how many SMS messages are sent each year. According to the International Harald Tribune, few experts could come up with a recent, reliable figure for the number of total texts sent in the course of a year but estimations puts the number at two trillion to three trillion while at England alone the number weekly SMS barometer just passed one billion - 25 percent higher than a year earlier. By the way, cool Papworth, shown in the above photo from iht, still seems to be working for Airwide Solutions - a dominant player in the next-generation mobile messaging industry. I guess some companies know how to keep their A class personal. Cheers to Papworth and Airwide Solutions. Happy Birthday SMS! 5 Mysterious Skulls: Dare They Be Called, Human?